Nothing succeeds like success. And behind the success there is always more than 100 percent, relentless hard work. 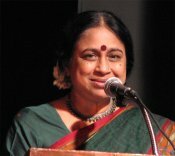 When Bharatanatyam exponent Ananda Shankar Jayant as a Nritya Choodamani of Sri Krishan Gana Sabha was asked to convene the 28th (17-23 Dec 2008) and 29th Natya Kala Conference, she took up the task with utter sincerity, leaving no stone unturned in the process, devoting all her time and energy in conceptualizing the theme, the speakers, dancers, critics, scholars, sponsors, giving minute attention to several details, brainstorming her dancer friends, critics, scholars and drawing up a plan which indeed covered a vast canvas, exploring several myriad forms of the performing arts that have dealt with the epic Ramayana. The conference concluded on the 23rd December and I am writing now, still full of the happy memories and the magic, the spell under which we, who attended the conference, are still relishing various highlights of this memorable event. From 1980, when Dr. Padma Subrahmanyam at the invitation of late Sri Yagnaraman, the secretary of Sri Krishna Gana Sabha, as a conevenor, initiated it for first three years, to the 28th conference, I have been, barring a few years, regularly attending it, gaining knowledge, listening to scholarly presentations and watching demonstrations, enjoying the ‘Madras season.’ Several Nritya Choodamani dancer awardees have convened the conference from year to year and the conference has been a major landmark in the world of dance. From abroad the NRIs make it a point to participate, attend it and from within India several ‘regulars’ are seen there. They look forward to attending this unique yearly get-together. Ananda chose Ramayana in Performing Arts as a theme, consulting Anita Ratnam and senior dancers like Padma Subrahmanyam, Chitra Visweswaran and also others including dance critic Leela Venkataraman and I. And we all appreciated it. Various characters of Ramayana, how dancers in different dance forms have handled them, how they have been perceived and also its interpretation in contemporary Indian dance has been dealt with, how beyond the shores of India in South East Asia and elsewhere Ramayana is staged, its global impact et al generated quite an interest. Continuous correspondence by e-mail and phone calls, persistent, persuasive, pleasant following up have resulted in a rewarding exercise for Ananda and all the rasikas. From the word go to the final day, one saw excitement and eager crowds from 9.15 am till 1.30 pm attending the conference. Meticulous attention to décor, backdrop (paintings by Pratima Sagar), designs, carefully removed banners, which violated visual aesthetics, maintaining time - Ananda managed things commendably. For past few years, the attendance at the conference, for several reasons, had dwindled. This year it looked beyond doubt that the conference had got ‘a shot in the arm’ and it had livened up. The atmosphere was full of celebratory mood. There were M Madhu (cherial), Vishvanath Reddy (kalamkari) and Khande Ramdas (leather puppets), all award winning artisans who had put up the exhibition and there was a brisk sale of the art objects available. 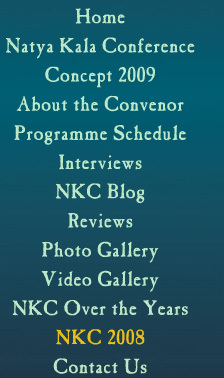 One of the finest things planned by Ananda was the Natya Kala Conference Daily newsletter, edited by Lalitha Venkat, the editor of www.narthaki.com, with daily report of the conference by Pratima Sagar from Hyderabad. It contained a mine of information, interviews, reviews, quotes, comments, announcements, photographs and little known aspects of Ramayana. Very professional and brought out dot on time. People made a bee line for it the moment they came to the venue. 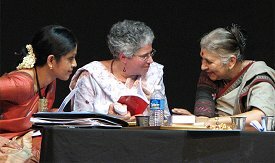 Anita Ratnam supported the concept full heartedly. It gave introductions to the participants, dancers, scholars, critics and provided a forum for exchanging views. I have seen similar daily newsletters at the International Film Festivals. Involving meticulous research by Ananda, another major achievement was the Natya Kala Conference souvenir, containing articles by the participants with brief introductions to the theme of the paper and authors, well designed with apt drawings and sketches by Pratima Sagar, who also edited it. It is indeed a collector’s item. Sponsored by Vijay Nirman Company Private Ltd, Vishakhapatnam, it has set a model for future souvenirs for such conferences. In the past also souvenirs have been brought out, but in terms of its production values and content, this souvenir stands out. It has brought Ramayana writings up to date with excerpts from Ashok Banker’s Ramayana (Penguin Publications), and reproductions of rare miniature paintings from the collection of art historian Jagdish Mittal from Hyderabad. I read it from cover to cover and it was refreshing as well rewarding to ‘re-visit’ Ramayana, not only seeing the demonstrations on stage, but also the conceptualization by dancers, scholars giving fresh insights into Ramayana. K Jayakumar, Additional Chief Secretary, Govt. of Kerala, a lyricist, a painter, playwright, and former joint secretary, Culture, Govt. of India, delivered the keynote address emphasizing the family values reflected in the Ramayana. Dr. Padma Subrahmanyam, with her inimitable exposition of selected sequences from Ramayana and depicting navadha bhakti, the nine ways in which different characters of Ramayana expressed their devotion to Lord Rama, captivated the audience. It was followed by Dr. Prema Pandurang’s discourse on Ramayana with comments and excellent art of oratory. The tone was set and the mood was upbeat, promising rich fare from day to day. Slowly and with care, the forum of Sri Krishna Gana Sabha is opening to the changes that are sweeping over the dance world and new directions are being brought to a mixed audience, which was further underlined by Navtej Singh Johar’s contemporary work he presented with his partner Sudeep Nair on similar vein, speaking and dwelling upon Dravya, Kaya, Bamboo, Bark and Earth indicating Kodanda bow and Lakshmanrekha episodes, choreographing in a novel manner, using yogasana vocabulary of physical traditions, inspired by working with Chandralekha and using objects which have power, which can be revealed by concentration and meditation! The very fact that die-hard traditional Kalakshetra maestros were watching it with rapt attention and applauding these artists’ efforts is an indication of how far the Indian classical dances have moved and travelled. The daily presence of veteran Chinna Sarada, Jayalakshmi, Kunhiramans, CV Chandrasekhar, Dhananjayans and young Kalakshetra students was heartwarming. Kalanidhi Narayanan, Mrs. YG Parthasarathy, Chitra Visweswaran, VAK Ranga Rao, Padma Subrahmanyam, Jaya Subramaniam (from Ottawa) and several NRIs including Hema Rajgopalan, her daughter Krittika from Chicago, Anandavalli from Sydney, Pushkala from London and several others warmed up the participating dancers and speakers. Gowri Ramanarayan spoke on Sita-a spectrum and drew parallels with Drauapdi and Meera, and read a contemporary poem on Sita. Her colleague from theatre, Bala asked a question. “With all this awareness of the tyranny of patriarchy, why do classical dancers perform these mythological characters only?” The question was left hanging in the air as dancers, it appeared were in no mood to quibble. presented excerpts from Sitayanam in Mohini Attam, which unfortunately appeared not well structured. It would have had impact if Neena had interspersed her talk with demonstrations. From Kamalabari Sattra on Majuli Island, from Bhogpura Sattra from Jorhat and other two Sattras, monasteries from Assam, a group of Sattriya dancers gave an absorbing account of Ramayana in Ojhapali dance form, telling the story of Sitaswayamvaram and Parasurama’s garva bhangam, when he got enraged at Rama’s wielding and breaking the bow of Lord Shiva! Rarely seen outside Assam, the Ojhapali Sattriya form sent by Sangeet Natak Akademi aroused great interest amongst local dancers and scholars. Both Leela Venkataraman and I had luckily seen the presentation of Bhogpur Sattradhikar at Guwahati and were delighted that the form was brought to Chennai. In terms of sheer variety of dance forms, sincere and conscious attempts on part of the dancers, some of the stereotype characters like Soorpanakha (sic) and Manthara were redeemed. Swapnasundari’s Soorpanakha left an indelible impression and one would remember it for a long time. Her depiction of Soorpanakha as per the Gyanpith awardee poet Viswanatha Sathyanarayana’s Telugu work ‘Ramayana Kalpa Vrikshamu’ was spell binding. Taking few key words, Swapna regaled the audience with her captivating abhinaya, dwelling upon the metaphors and utpreksha, similes and literary conceits, singing padyams, vasantatilaka chhanda and the like while portraying Soorpanakha in colours and hues which changed for those present, the image of Soorpanakha for ever from a hideous demoness to a voluptuous woman of beauty and sensitivity! To wit, paraphrasing the padyam ‘Virisi Manmadha-razu,’ she enacted with angikabhinaya: it was as though the yawn of Manmatha which filled the sky, assumed a female form; it was as though the bow of Manmatha broke with a crushing sound which assumed female form; it was as though the ashes of Manmatha’s body, when burnt by the third eye of Shiva, assumed the female form; it was though Rati on the death of her husband, assumed the female form..Soorpankha’s beauty was composed of these elements. She rolled her eyes in enticing manner, while looking at Rama, at Lakshmana and at Sita, taking an overview of the Panchavati dwelling and with mukhajabhinaya brought to life Soorpanakha in a unique way. One more instance: Soorpanakha compliments Rama on his complexion sings: ‘Neyredu- padlerupu neeli pagullar rangai,’ thou whose hues resembles the colour of jamun fruit, splitting as they ripen on the tree! Allow me to catch you in the pallav of my raiment, so you may not be hurt by falling to the ground!! Soorpanakha’s growing desire for Rama is cleverly stalled by Rama asking her to reveal her real form. Revealing her demonic form, she assures Rama that if her husband does not obey she shall kill him!! Rama tell her that he will not deviate from Dharma as he is ‘eka patnivrata’ and Soorpanakha retorts that Kama, desire, is one of the Dharma also. The poet maintains consistency in vesting Rama’s character with gentle humour throughout the sequence; he manages to draw the reader’s full attention to the character of Soorpanakha evoking sympathy for her in a seemingly unintentional way. Swapna succeeded in bringing out Soorpanakha as a forthright woman capable of logical argument, whose singular fault would appear to lie in her openly expressing a desire for Rama. A woman scorned in love is a bad enemy but a woman scorned in love and then pitied by her rival is the worst enemy imaginable. Sita intervenes at the penultimate stage of the episode to tell Rama that perhaps he should not judge Soorpanakha so harshly, for after all, which woman can resist his awesome beauty? These words drive Soorpanakha into a flying rage and she tries to attack Sita when Lakshmana disfigures her! This was one of the highlights of the conference. Manthara also is depicted as a wicked woman. Sharodi Saikia, the Sattriya exponent from Guwahati, drew her portrait in sympathetic manner. Also she brought unusual variation and story element not known to many of us from the Assamese Ramayana version of Madhav Kandoli of 14th Century AD. With the text inspired by the work of Dr. Indira Goswami, the Gyanpith awardee, Sharodi depicted an incident as follows: Not following Valmiki’s work blindly, for entertainment of the common masses, Kandoli incorporates an interesting episode. Having succeeded in her mission in converting Kaikeyi’s mind, she harbors a secret ambition of ruling Ayodhya that Bharata would reward her by accepting her as his mistress and a queen as soon as he becomes a king.Although she was old and a hunchback, to lure Bharata she adorns herself with royal ornaments and places a golden disc on her back to cover her hunch! But she meets with punishment from Shatrughna for her audacity. Sharodi explained that in later years this episode was frowned upon by the Assamese scholars and authors. The later poets inspired from Kandoli avoided his episode from their versions, though the great Saint poet Sankaradev kept the monumental work intact. 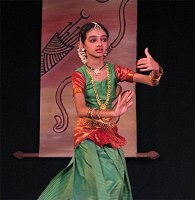 However, the audiences and the dancer agreed that Manthara need not be depicted in this manner. Neither Soorpanakha nor Manthara in present times are accepted by the dancers and audiences to be ridiculed and there is a certain awarness amongst the artists and audiences to respect women. Another highlight of the conference was Sophiline Shapiro, a dancer and choreographer from Cambodia who with her disciple demonstrated the salient features of Cambodian dances. The intimate relationship between sculpture and dance, the living tradition of dance, influenced by Indian epic and dance forms were well illustrated as also by screenings of the DVDs. Ananda had met Fred Fremburg, an American opera conductor and deeply interested artist in Cambodian dances in Phnom Penh when she had participated in a Ramayana conference few years ago. Sophiline has been reconstructing lost Cambodian dance tradition after the political upheaval in Cambodia. Her all women troupe’s work is well known internationally. We had met during a conference in Paris three years ago and I was delighted that she was participating in this conference. Using traditional dance style, she brings contemporary sensibilities to her choreography stressing upon harmony and equanimity, using the symbol of Hari-Hara. Her participation added another dimension to the conference. To supplement Sophiline’s presentation, I had chosen to present Kechak dance of Bali and to show how Indian Diaspora in America has worked with Balinese dancers using traditional Bharatanatyam. I screened 2 key excerpts: one of Dewa Putera of Chudamani Dance Company of Ubud, Bali and Minneapolis based Ragamala Dance Company of Ranee Ramaswamy performing at the International Ramayana Festival in Bali in 2006 and another of Ragamala’s group work presented with American and Balinese dancers using Kechak dance form at Sculpture Garden. Dr. Pappu Venugopal Rao very kindly edited the two DVDs for my presentation. 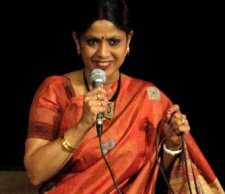 Hema Rajgopalan and her company led by her daughter Krittika had worked with 100 young musicians in an opera on Ramayana two years ago. These attempts are generally not known in India. VR Devika, in her story telling presentation of Ramayana, succeeded in having more than 200 school children, for the first time in Sri Krishna Gana Sabha auditorium, answering and responding to several interesting questions. On screen she projected the map of India and the route of Ramayana in different states. 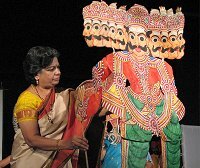 Using the leather puppets with characters of Ramayana, the puppeteers told the story, and three male folk dancers performed and sang in the front. It was such a fascinating sight and the auditorium reverberated with joyous sound of children. This was another highlight of the conference. One only regretted that children and schools were not informed about the Little Ballet Troupe’s performance of Ramayana, in which human characters dance as puppets, when during a fair the puppet show is mounted. Choreographed by late Shanti Bardhan in the fifties, it is a remarkable production and a landmark in the history of dance. Very original and brilliant!! Sangeet Natak Akademi had sponsored its presentation. The conference gained momentum with the unfolding of various facets of Ramayana in different dance styles. Prof. CV Chandrasekhar and his daughter Manjari recreated using Bharatanatyam style, the nostalgia of Tulsidasa’s Ramacharitamanas, as they were in Varanasi, Benaras, for more than 25 years and were seeped into the magic and music of the chaupais, which is a shared tradition in North India. 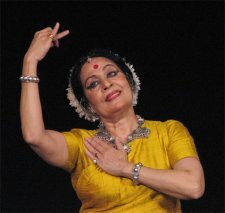 Sonal Mansingh also presented Sita Swayamvara episode using the text of Tulsidasa’s Ramacharitamanas in Odissi, to the evocative singing of Bankim Sethi. Alekhya Punjla, the dusky doe-eyed Kuchipudi dancer from Hyderabad, sketched the portrait of Mandodari, the wife of Ravana. 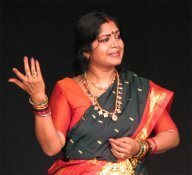 The traditional Kuchipudi Mandodari shabdam, with vachikabinaya, the dialogue, a salient feature of Kuchipudi dance-drama was presented charmingly. Using contemporary poet Mallemala’s text Alekhya’s presentation introduced an interesting element not generally known about Hanuman mistaking Mandodari as Sita. Since he had not seen Sita, he seeing the beauty of Mandodari mistakes her for Sita. But soon realizes that it is Ravana’s wife. Mandodari’s final anguish and heart-rending vilap, crying, knowing fully well that Ravana will be killed at the hands of Lord Rama, was enacted poignantly and with the dignity becoming the wife of a great King. Madhu enacted the role of Hanuman with consummate artistry. The ‘stobha,’ establishing the character in Kudiyattam, a convention, was impressively employed. It is worth to learn that Madhu along with his elder brother Margi Narayanan has been working towards bringing back audiences to an art that would have become extinct. Madhu is a Professor at the Theatre Department of Shri Sankaracharya University of Sanskrit (Kalady, Kerala), runs Nepathya Institute, a project of his wife Dr. Indu G Nair, a Nangiarkoothu exponent, at Aluva. It indeed was a rare presentation; even though brief, it engaged immediate attention of the audience the moment the two mizhavu (the copper drum) players played on the drums seated at the back of the performer. Each day the conference threw up as it were gems of demonstrations and novel approaches to Ramayana. From Mumbai, Kathak exponent and actor Rajashree Shirke and her troupe captivated the audience with their spirited Ravan- Mandodari samvad. Employing the tradition of story telling, the Kathakar paddhati prevalent in Maharashtra with dramatic impact, Rajashree and her dancers won over the audiences with their excellent presentation. The use of tatkar, the footwork of Kathak, the dancers turning into various characters, and the battle, the duel between Ravana and Rama, were not only gripping but electrifying. The well known sadara of Bindadin Maharaj ‘Shesh fana dagamagyo’ danced by Rajashree begging Ravana not to fight with Lord Rama, indeed was again heart-rending, and very moving. Rajashree’s son who composed the music also used the band dramatically. And like icing on the cake came the excerpts from Rukmini Devi’s dance-dramas from Kalakshetra. Vastly gifted Sheejith Krishna, with a commanding stage presence displayed Ravana’s facets as he has studied from his senior predecessors like Janardhanan and Balagopalan. 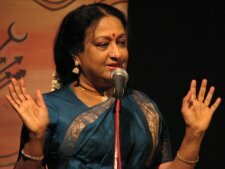 How Rukmini Devi used Kathakali technique and also drew inspiration for costume of Ravana and other facts were brought to the notice of the audience by Sheejith. In particular, the spirited dialogue between Ravana and Sita from Valmiki’s Ramayana brought happy memories of Rukmini Devi’s genius in etching portraits of both Ravana and Sita. Though I have seen Rukmini Devi’s Ramayana dance-drama series many times, I must confess I had forgotten many salient features and like many others present marvelled at Rukmini Devi’s approach and vision. This re-visiting of Ramayana was like a bonus. 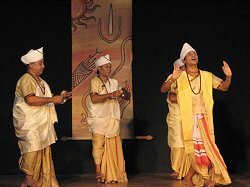 The high standard of Kalakshetra was writ large on each scene, be it costumes, music, dance and abhinaya. Such a legacy of rare aesthetics will always keep her productions a notch above other dance-drama productions of Ramayana. 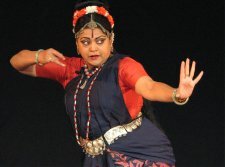 Ananda is a product of Kalakshetra and it was a befitting gesture on her part and artists from Kalakshetra to showcase Rukmini Devi’s choreography of Ramayana. Those whoever has seen the series and those who saw for the first time indeed expressed great pleasure and unalloyed joy witnessing the sequences. Sheejith’s analysis and deep study are praiseworthy. Ananda, wanting to explore other areas of Ramayana in different genres like traditions of bhajan singing in Maharashtra, introduced Raghunath Khandelkar, abhang vocalists to render songs extolling virtues of Lord Rama. Well known Carnatic musician, composer, singer OS Arun rendered Tulsidasa’s bhajans in his inimitable way and melodious voice. Who can forget ‘Thumaki chalat Ramachandra bajat painjania?’ or ‘Shri Ramachandra kripalubhajamana,’ the evergreen compositions? Venu Madhav’s Ramayana Sankeertanam was another interesting rendition. However, since there was spilling over of the time and singing being scheduled towards the end, the audience participation was limited. If they were scheduled before dance-demonstrations, there would have been more response. This was not enough for the convener. Therefore she had included the next generation participants like Mahati Kannan, 10 year old grand niece of Padma Subrahmanyam in Bhavayami raghuramam composition of Swati Tirunal. She stole the hearts of all present with her artistry. She is bound to go places. The confidence and natural grace, born to the manner Mahati has head start advantages with an aunt like Padma Subrahmanyam, parents like Kannan and mother Gayatri who is a dancer and singer. For her generation she provides a role model. 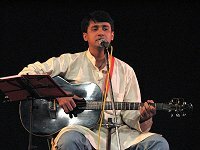 Anita Ratnam had recommended a young guitar player Vedant Bharadwaj who strummed on guitar, Rama bhajans of Kabir and Tulsidas. He loves classical music and feels that through popular bhajans and instrument like guitar, he can get his peers interested in classical music. The inclusion of both these artists was a brilliant idea. Another interesting feature was screening of animation film ‘Sita sings the blues’ of New York based film maker Nina Paley. The witty interpretations of Ramayana do not hurt anyone. As a matter of fact, one notices Nina’s metaphorical adaptation of Ramayana into her own story. The images from miniature paintings to animated images and the singing of the blues haunt the onlookers as Sita adapts them into her experiences. It was screened at Alliance Francaise de Chennai and drew a section of the audience who enjoyed the catholic approach to Ramayana in many media, including films. As Ananda had observed in her address, when Ramanand Sagar’s television serial on Ramayana was telecast the entire nation watched it. The tale of Ramayana adapts and renews itself in contemporary times. The blackberry and i-phone toting executive, the video game punching youngster, the animator, the film maker and the TV soap creators alike are all inspired by the Ramayana. All good things have to come to an end. Dance critic Leela Venkataraman in her concluding remarks spoke eloquently on the several aspects of Ramayana as presented in the conference, and also covered in her excellent article Ramayana, a Pan Asian Tradition. 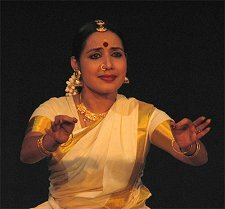 She shared with the audiences her own unforgettable moments of seeing the legendary Kudiyattam artist late Ammanur Madhava Chakyar’s last performance in New Delhi at the National School of Drama. Her vast exposure to the performing arts, regularly writing for The Hindu and wonderful gift of articulating her transparent joy with readers and rasikas was evident in her observations. On behalf of all, Padma Subrahmanyam honoured Ananda Shankar Jayant, the convener, with a shawl in appreciation of this conference. There was a lunch at the end of the conference on the venue of Krishna Gana Sabha and it seemed the participants did not want to leave the magic created by the conference. The conference indeed succeeded in making the participants exchange views after the sessions. I suggest the convener should announce in advance about the lunch every day by buying the coupons, so that those who wish to ‘hang on’ and talk can do so. Earlier at one of the conferences, Anita Ratnam and I had worked out that strategy, which was very successful. It can be repeated. Since everyday there were nearly four papers/presentations, the time constraints were felt. Many who wished to attend other presentations found it difficult to carry on till 1 or 1.30 pm. It would help if there is less overcrowding of presentations. In any case, the conference was a very rewarding and a memorable experience. Dr. Sunil Kothari, dance historian, scholar, author, is a renowned dance critic, having written for The Times of India group of publications for more than 40 years. He is a regular contributor to Dance Magazine, New York. 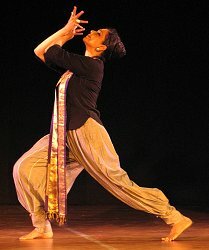 Dr. Kothari is a globetrotter, attending several national, international dance conferences and dance festivals. He has to his credit more than 14 definitive works on Indian classical dance forms. 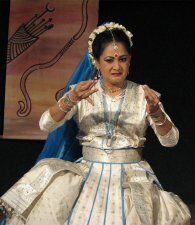 Kothari was a Fulbright Professor and has taught at the Dance Department, New York University; has lectured at several Universities in USA, UK, France, Australia, Indonesia and Japan. He has been Vice President of World Dance Alliance Asia Pacific (2000-2008) and is Vice President of World Dance Alliance Asia Pacific India chapter, based in New Delhi. A regular contributor to www.narthaki.com, Dr Kothari is honored by the President of India.